The pumps are used to move the fluid by consuming the energy. The pump is a device that is used to transfer the fluids water, oil, gases, slurry by consuming and using mechanical work. Energy used in a pump can be engine energy, electrical energy or other non conventional energy i.e. they are electrical motor driven centrifugal pumps or mechanical driven pumps. Pump Works according to some mechanism (rotary or reciprocating). This mechanism converts energy into mechanical work. Although, there are many type of pumps but we will discuss the important one i.e. Centrifugal pump. Centrifugal pump uses the centrifugal force to pump the fluid. it is the kinetic energy type of pump. It is a type of dynamic axisymmetric pump machinery. The centrifugal pump increases the head of fluid by converting its kinetic energy into hydrodynamic energy. this kinetic energy is rotational type. The rotational motion in the fluid will come through the energy source like engine electricity etc. Centrifugal pump is used widely because of it's Simple design, high capacity, high head and large efficiency etc. 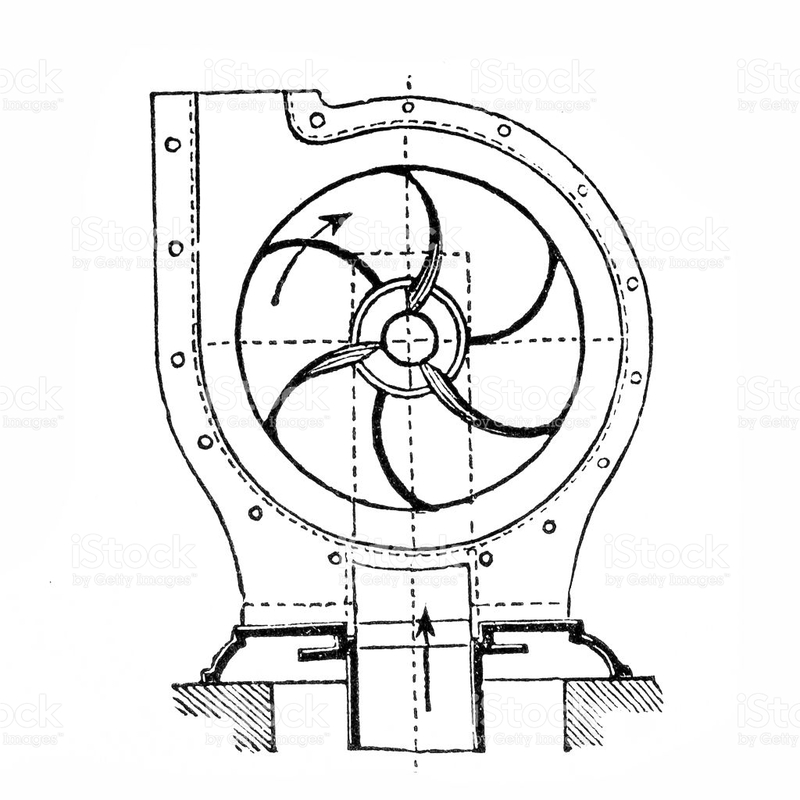 Pumps in which the fluid enters at the centre of impeller and the impeller blades directs the flow at right angles outwards to the pump shaft are calles radial flow type pumps. This type of pumps provides high head and high efficiency. Axial flow pump provides low head but large quantity of water. 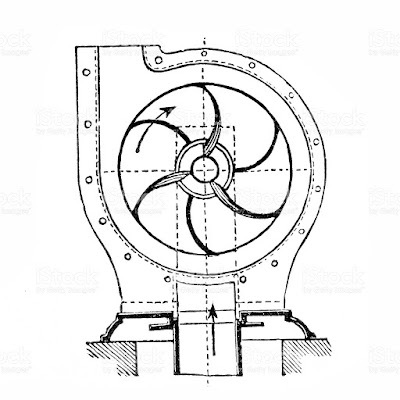 In this type of pump the impeller pushes the fluid parallel to the shaft. Axial flow pump also called propeller pump because of its operation is analogous to the propeller of boat. these pumps has Qualities of both radial and axial flow pumps. When the fluid travels through the impeller the Blades of impeller will push the fluid outwards from the pump shaft to the pump suction angle greater than 90 degree. Mixed flow pumps mainly used for irrigation purposes. In the volute casing the area of casing will be increased from impeller to outlet. This will cause the decrease in the velocity of the fluid. The decreased velocity will finally increase the head. In this casing a circular chamber is introduced between the impeller. This circular chamber is called vortex and casing is called vortex casing. In the single stage centrifugal pump one impeller is used in the pump shaft. The type of pump is used where low head is required. When high head and high discharge output is required. Multiple number of impeller can be used in a single shaft. The potential of water or water head is the desired output of a pump so we can classify according to the head Obtained from the pump. The pumps which can provide head up to 15 M are called low lift centrifugal pump. The pumps which can provide head more than 15 M and less than 40 M are termed as medium lift centrifugal pump. The pumps which are able to produce head more than 40 M are referred as high lift centrifugal pumps. If the liquid contains solid matter to pump then the open impeller is used. If the shaft is placed horizontal it will provide ease of orientation and maintenance. If the space is less then the shaft is placed vertically. The volute Which receives the liquid pumped by the impeller is called casing of a centrifugal pump. Volute is funnel shaped element of increasing area. It slow downs the rate of flow of liquid. To move the fluid from small quantity to large quantity centrifugal pump is used. The centrifugal pumps uses the rotating impeller to create vacuum. Vacuum causes the movement, then this movement drives the fluid to the outside of the pump housing. Then the pressure is increased and the liquid is moved towards the discharge. Suction head is the vertical distance from the centre line of pump shaft to the level of fluid to be pumped. The rotating part of centrifugal pump is called impeller. It takes energy to rotate and pump the fluid outwards. It is made of metals like steel, aluminium, brass, also made of rubber and plastic. Pump head is the ability of pump to deliver air pressure to make the fluid to reach at the maximum height. Head of pump is measured in height. The height upto which water can be raised by pump is called head. Priming is removing the air entrapped In The suction line and the pump, before starting operation of the pump. For this purpose the water is filled throughout the casing to remove the air present. while electrical energy is used to operate the centrifugal pump then we need to install electrical motor to pump the fluid at a desired head. that itself called electrical motor driven centrifugal pump. it is not a different concept or principle of centrifugal pump. There are 3 types of casing in centrifugal pumps -Volute, Vortex and Vane Diffuser being the 3rd type.A diffuser is actually a series of vanes surrounding the impeller which accepts the discharge of liquid from the impeller, efficiently reducing the velocity and, in the case of a multistage pump, directs this lower velocity fluid into vaned return channels which guide the liquid to the inlet or eye of the next stage impeller.